Tia’s funny. Often very funny. Her posts make me laugh. I like laughing. It’s highly recommended for good health. And we all need anything that helps with our health if we have celiac disease/are gluten intolerant/are gluten sensitive, right? Tia can ramble a bit (“but I digress”) and segue with the best of them. (My #1 could have been something that Tia would have written, but hers would have been better.) While I admire the folks who write ultra-short, succinct posts, I identify with the bloggers who don’t. 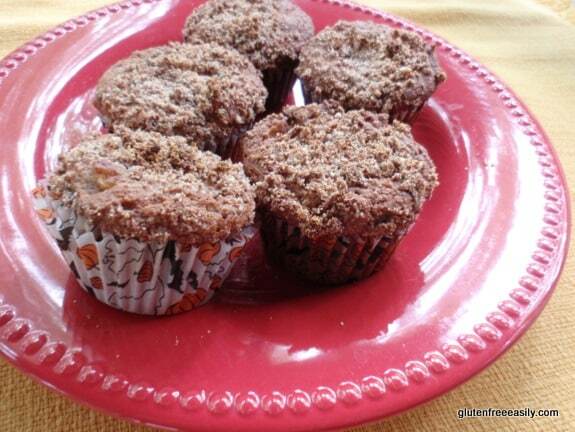 Tia makes fabulous gluten-free, grain-free, dairy-free, refined sugar-free muffins. In other words, heavenly “no guilt” muffins. The first time we met in person was at a food blogger’s conference. Tia knew there would be a large group of gluten-free bloggers in attendance, so she made 4 dozen muffins so all of us would be sure to have something safe to eat. Then she carried the boxes of muffins from session to session so we’d always have them as an option. Banana Muffins and Chocolate Banana Muffins—banana heaven? or chocolate banana heaven? … take your choice! Those are just two of the muffin recipes on her blog. Tia accepts a challenge and then WOWS us with what she has created. She saw Alisa’s (Go Dairy Free and Alisa Cooks) gluten-full Thin Mint Cookies and had to respond to Alisa’s suggestion/challenge on making these gluten free. Did she just make a “passable” gluten-free version? Oh, no, she made a gluten-free, grain-free, refined sugar-free, slice-and-bake version of the Girl Scout Thin Mint Cookies. If the Girl Scout organization was smart and decided to make gluten-free cookies, Tia could truly make a mint selling this recipe to them. And, oh, we, the gluten-free consumers, would be so lucky! Tia also rose to the challenge with beautiful raw cookies for the April in the Raw event—Raw Chocolate Mint Balls and Raw Chocolate Sunbutter Thumbprints. Rawsome! See both recipes here. Tia also makes simple savory meals. Meals like Carne Asada Stew, Crockpot Lamb and Cabbage, and Pulled Barbecue Chicken Sandwiches. I’d love to come home to those on my table. She shares valuable product reviews. Reviews of products she deems healthy. For example, she has a review and giveaway up right now for The Marvelous Food Company cookies and cupcakes. Not something we want to eat that often, but when we do splurge, it’s nice to know that Tia has done the hard work for us! She has fun with her food. With Tia, you don’t get just regular old lasagna, you get Christmas Lasagna (Red and Green). If you want to break with tradition this holiday, or have a special, Italian-themed Christmas home alone, this might be the perfect recipe for you. Tia writes heartfelt posts that we all can understand. This one about how being glutened at a family event forever tainted her memories of time spent in a special spot with them really spoke to me. The post also shares how she had slowly came to realize that certain symptoms meant she had been glutened. This info is important for others new to gluten free. The symptoms aren’t always obvious early on. It’s only when we remove gluten and keep it out that an accidental ingestion really gets our attention. And sadly, some folks never experience symptom from being glutened. She has recently launched a new feature called Gluten Free News You Can Use. I love it! Now I can count on Tia to keep me up to date when I don’t have time to read all my favorite blogs. Her most recent roundup is here, and her next one should be up soon. Tia is a great mom and shares some of her experiences with her adorable son, who she has long called The Little Man. Those experiences include being sure that he’s getting nourishing food and learning to like lots of foods. One thing that Tia likes to do with her son is simple craft activities, the kind that we all remember from childhood. She shares these fun and easy ideas at her other, newly launched site, Max and Mum Kids Activities. Yep, she revealed that The Little Man is named Max. On Max and Mum, she’s sharing activities that she and Max do together … ones that you can do with your child, too. And she’s not giving you step-by-step instructions in text, she has how-to videos on the activities. Even though all of the activities are very simple, it’s still nice to see the steps and the final results. The most recent activity she posted is How to Make a Jack-o-Lantern Mask. I for one adore anything Halloween and the fact that this craft uses a paper plate, a hole punch, markers, glue, and yarn takes me back. To my own youth, to making crafts with Son when he was a tyke, to teaching third grade (Halloween was a wonderful time for my class with carved and stuffed pumpkins, puppets shows, and more), and even teaching vacation Bible school. I’m also quite fond of Max and Mum’s paper bag puppets—for example, the elephant and the monkey. Now, I’ve told you a lot about Tia and her blog, Glugle Gluten Free, as well as her new website, Max and Mum Kids Activities, but the purpose of these adoptions is to try out at least one of your adoptee’s recipes. The choice for me was clear—one of Tia’s muffin recipes (remember #3?). 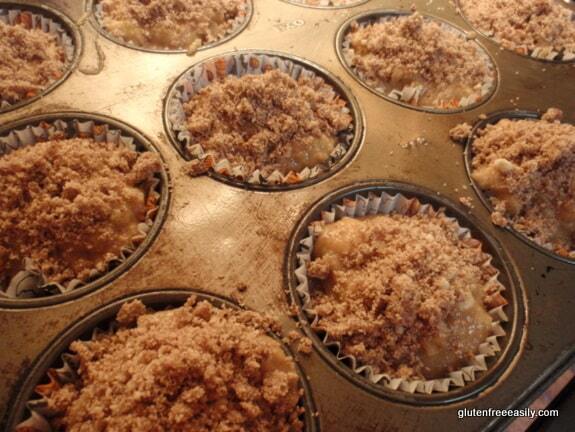 Her Apple Crumb Muffins seemed perfect for fall and they are! They’re another one of her gluten-free, grain-free, dairy-free, refined sugar-free recipes. The recipe comes together quickly. 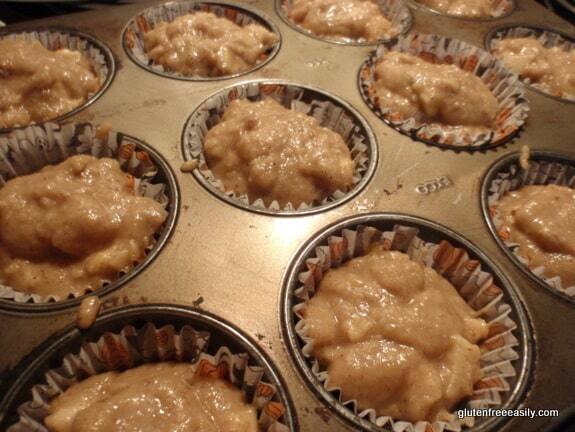 The muffins are not overly sweet, plus they’re so tender, moist, and most of all, delicious. I took them to my dad’s birthday celebration the other day. Even with a dessert spread of ice cream cake, my brown sugar chocolate chip cookies, and my chocolate silk pie, not even one single muffin made it home with me. There were a few left at the end of our party, but my niece snagged several for her breakfasts and mom quickly stashed the rest under the protection of the glass dome on her cake plate. I could hardly fault either of them. Yes, these muffins are worth adding to one’s repertoire for sure (here are a few more step-by-step photos below), and Tia and her sites are definitely worth adding to your blog reading! And don’t forget to head over to Sea’s for the complete roundup! Tia is awesome, and I definitely agree that she makes fantastic grain-free muffins! Hi Alisa–Yes, Tia is awesome! 🙂 We were so lucky to get to enjoy Tia’s muffins at BlogHer Food, and this recipe is another winner! Great adoption post. Wow. 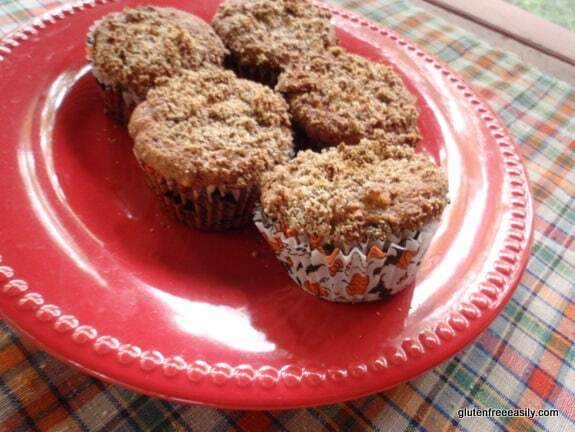 And I could totally get into those muffins with the crumb topping…yum! But first I’m off to check out grain-free thin mint cookies. I’m a touch distracted by them. They’re calling my name. Only one problem. You picked the week that I decided I needed to go to every other week for the News You Can Use. Got a little overwhelming. Well, now you can expect a big ol’ giant NFL tackle when I see you. You are the best! If we had any family there, I would move to Virginia just so I could come and see you every day. Better put on my pads and other gear if you’re going to tackle me! LOL And, too sweet on considering moving to VA so we could visit with each other every day! Shirley- I really enjoyed your post – thanks for introducing me to Tia – these muffins look super and so do those thin mint cookies! I’m thinking these wouldn’t last past a few hours in our house. I’ve eaten Tia’s muffins before and they are finger licking good! Great pair – you and Tia! Awesome muffins!